"Unfortunately, the authors have decided not to make their data publicly available." The lack of Danish markers, despite their well attested presence, really does make me think that St Brice's Day massacre was part of a comprehensive ethnic cleansing. The massacre also seems to point to a population that didn't intermarry or assimilate, and was therefore fairly easy to identify and kill. I haven't had the opportunity to fully read the paper, but my first glance they seem to come to a few contradictory claims. Islanders are highly monolithic, accentuated by recent exogenous admixtures but they also see no evidence of a unified pre-saxon substrate? They also should define "Dane" and "Jutish". Overall, this would be a great resource if they release the data. If they don't it will fizzle and become irrelevant in future studies. "Thus, this data, perhaps the richest genetic survey of any country to date, will not be fully utilized to further science." The British establishment likes to dictate to people. We would be able to run their data and evaluate their conclusions and they don't want that. which is exactly what we have come to expect from the British establishment and never ever anything else. I have some questions about their methods. How have they estimated "saxon" ancestry? Have they used modern Danish samples? History tells us that the Angles, Saxons and Jutes totally vacated their Jutland homeland and came to England. Modern Danes are descended from North Germanic speakers from the eastern islands, after the West Germanic speakers vacated Jutland. How have they detected Danish Viking input? Have they again used modern Danish samples? If so, how have they distinguished Vikings from their "Saxons"? I find it bizarre that they ignored most of Ireland since the pre-Saxon population of Britain was probably related to that of Ireland. Its annoying that there is no comparison to any ancient dna (Hinxton Celts/Saxons, Beakers, Farmers, HGs, etc) and that they did not share the dataset publicly so those of us who would do the comparisons ourselves are unable to. Without the context of an ancient genome reference this study is all just speculation. "However, the data do suggest that the Welsh clusters represent populations that are more similar to the early post-Ice-Age settlers of Britain than those from elsewhere in the UK." Not buying that. There is ABSOLUTELY NO EVIDENCE for this statement. There was no ancient DNA in this study. The Welsh (and to a lesser extent the Scots) look more like the French (Fra12, Fra14) and Spanish, and presumably if they had been tested, so would the Irish. The old "mediterranean" influence. Nothing new to see here. There does not seem to be a real "Saxon" proxy. Ger3 and Ger6 overlap in Saxony, and the source populations of NW Germany. It is difficult to see how that data can be used to infer Saxon ancestry. If you assume everything "German-like" must be Saxon, then you might as well assume that the French conquered and replaced the population of Wales!!! It has equal validity (or lack thereof). So far as I know historically the Saxons had no significant occupation of Cumberland and greatest occupation of SE England. Yet for Ger6 the similarity is ~2x HIGHER in Cumbria than in Central England. Ger3 is much higher in Central England than Cumbria, but similar to Devon and West Yorkshire, neither is likely to be high in AngloSaxon ancestry. Neither were part of the original Saxon holdings and although Devon was ruled by Wessex the original rulers of Wessex had RomanoBritish names speaking to significant racial heterogeneity. This Saxon rubbish is a triumph of preconception over logic. This paper is the best evidence I have ever seem AGAINST a significant AngloSaxon genetic contribution to to Britain. Again Britain is looking like a mixture of Mediterranean and Doggerland folk (similar to the Danes and Germans). I am not sure what to make of FRA17. It looks like it might be important. If they are meant to be Norman proxies they are darned German for a Vikings. Any ideas about the Pembrokeshire, Welsh and N. Ire./Scottish groups that have positive correlation with SFS 31 and FRA 12, but negative correlation with FRA 17 and GER 3? Hopefully the continental data release will have more information. Unfortunately the paper isn't for free, even though the supplements are and through them we may understand much. It is true what Dienekes writes, that it is a pity that the data aren't put at disposal of everyone so everyone may exam them. But from some reviews I found these sentences: "There is also little Roman DNA in the British genetic make-up [...] It reveals that the white, indigenous English share about 40 per cent of their DNA with the French, about 26 per cent with the Germans, 11 per cent with the Danes and in the region of nine per cent with the Belgians [...] Other major events in history, such as the Roman invasion and occupation between 43AD and 410AD, the large-scale invasion by the Viking Danes in 865AD and the subsequent establishment of Danelaw, as well as the Norman invasion of 1066, cannot be seen in the genetic profiles of Britons today [...] Most soldiers serving under Rome who came to Britain were in any case more likely to be recruits from Gaul and Germany rather than being born in Italy, Sir Walter said". But this sentence may shed some light about the oldest inputs of the genetics of the Isles: "such as the ancient ancestry of the Celtic people of North Wales who are probably descended from some of the oldest inhabitants of Britain". Of course I am not interested to have something in common with the people of the Isles, but this research doesn't answer our questions about the oldest origin of hg. R1b, not only the R-V88, R-M269, R-L23 with the subclades Z2110 and above all CTS7556 which is linked to the subclade CTS9219, neither about all the other subclades, above all where P312 and its huge subclade R-L21 came from. Neither it answers to the origin of R1a, beginning from M420* well represented in the Isles to all the subclades which seem come just from Central-Western Europe, for not speaking of hg. I, prehistoric in Europe. I have the impression that these autosomic clusters may say something about mid-term origin, but not about the oldest one and about the numerous mixings happened since then. About the mt this research doesn't say if my K1a1b1e, I think born in Italy and very likely in Tuscany, reached the Isles before, during or after the Roman times, neither when the very likely Tuscan J2a1* reached Ireland, neither if may have happened the other way around. So Oppenheimer was more or less right after all? Of Anglo-Saxons and Celts he said "Neither group had much more impact on the British Isles gene pool than the Vikings, the Normans or, indeed, immigrants of the past 50 years." On November 5 2014 I posted remarks about the POBI Study on the Anthrogenica Blog. Now that the POBI Paper in Nature has been published on March 19, 2015, I still stand by those original remarks. Because of their failure to share data, the Authors (Walter Bodmer and others) and Sponsors of the POBI study need to be exposed for their unfriendly ways toward the lay Genetic Genealogy community. Some on this website think that the PoBI / GWAS people are friends of the Genetic Genealogy community .... they are not and alot of people fail to dig into the background for PoBI which appears to more Medical Genetics than Genetic Genealogy. The PoBI team's primary outcomes 'are intended' for large companies who are in the for-profit Pharmacogenetics community. The PoBI lead funder is the Wellcome Trust / Burroughs Wellcome. As other promising AIDS drugs reach the market, competition will force the price of AZT down. But that may be many months ahead, and meanwhile Burroughs's apparent profit bears little evident relation to its risks. The North Wales Green Squares Autosomal DNA Cluster in Figure 1 represents the most ancient britons. The POBI authors say: "The earliest migrations to North Wales (most ancient migrations / most ancient people) are best captured by three groups in the European analysis: GER6 (Western Germany) BELL11 (Belgium) and FRA14 (NW France) This early migration period was in the period 4000BC to 3000BC. These people coming to Wales likely departed from Belgium and France shores. My NGS research on R1b-L371 / R1b-S300 Y-DNA for 10 men from North Wales shows an age of at least 3500BC to 3000BC. Conclusion: Modern day R1b-L371 male descendants from these ancient people in Northern Wales can truly claim the title of coming from 'Ancient Britons'. It's too bad that the POBI researchers did not attempt to collaborate their findings and conclusions with available Y-DNA research and analysis from the Genetic Genealogy community. They collect surname (and in some cases facial topography) data for all individuals, plus year and place of birth for all grandparents. I imagine they only got ethical permission to collect so much not-very-anonymised data *because* they would gate-keep it. And some of the data is WTCCC data now, and that has strong safeguards on it too. In the UK, combined with Turi King's Y chromosome/surname database, it would be all too easy to identify individuals. And imagine if the police had access to something like this! "we're looking for a white British male, probably from North Wales, might be called [rare Welsh surname]..."
This is a FASIBD Autosomal DNA Clustering I did in 2012 for 10 men who are Y-DNA R1b-L371+ ... these men have a 'provable' Y-DNA genetic homeland in NW Wales. I showed 3 years ago that 10 tested men in my study had ancestors from NW Wales. And that these R1b men likely originated in NW France (see red areas on page 1 of the above mentioned PDF) before coming to Wales circa 3500BC when farming originated in this area. So, what the POBI team has published in Nature in March 2015 confirms my earlier findings.... these Welsh came from France. Dah Dah ... why did it take a team of 8 PhDs on this POBI study some 3 to 5 years to come to the same conclusion? Maybe they wanted to stretch out the US$5 million research and keep on getting paid from their Research Sponsors.
" Thus, this data, perhaps the richest genetic survey of any country to date"
Maybe, but do you know this similar study? No big surprise for me, just diappointment rest of ireland is excluded. Regarding research and genealogical dna being used by the police. They been there done that. The Y-dna donors have snitched out their 10th cousins. "The lack of Danish markers"
If they're using modern references and there was a counter-clockwise shift in populations during the migration period then their modern "northern French" could be migration era "west German" and their modern "denmark" and "west germany" could be east Germany and Scandinavia. "Islanders are highly monolithic, accentuated by recent exogenous admixtures but they also see no evidence of a unified pre-saxon substrate?" If the general pattern was always later invaders taking over the lowlands and pushing the previous layers back to the higher ground in the north and west then any unified pre-Saxon substrate will be part of that ultra homogenous red square mix in the lowlands. My impression is that the study seems to confirm that >50% of British ancestry is "French" and hence surely Neolithic. I guesstimate that the light blue French cluster represents Armorican Megalithic input, the dark blue one Danubian-like from NW France, the yellow Rhenish component is maybe Celtic and that's about it. 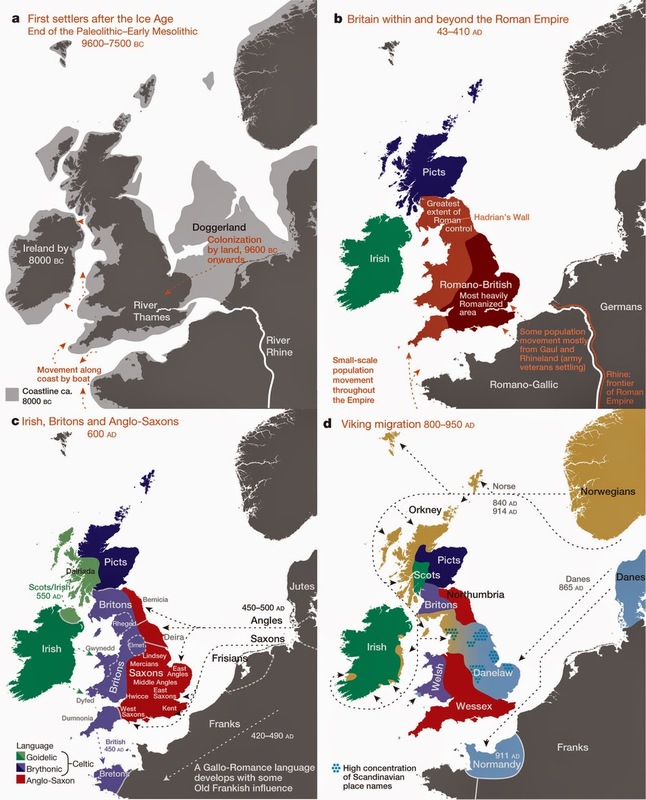 The orange Saxon and purple Danish could represent the Anglo-Saxon and Viking invasions. Scots = 40% Megalithist + 30% Danubian + 30% Celtic (lots of Danubian suggest maybe a secondary flow from North England, where there's a cluster with also lots of Rhenish influence). Just a shallow analysis, of course. "The English are not English and there are no Celts in Britain, nor any Viking ancestry. Britain is very diverse." "I guesstimate that the light blue French cluster represents Armorican Megalithic input, the dark blue one Danubian-like from NW France"
I think the components with the most in Wales will be the earliest waves (pushed west by later invasions) and the components with the least in Wales will be the last invasions. The dark blue doesn't appear in Wales at all so I think it came with one of the last invasions. No way to be sure though. We might all want to word-bash the authors for hiding their data , and indeed, their entire paper behind paywalls, but I can appreciate, at least at face value, their concern for participant anonymity. There is little point in trying to infer ancestral proportions on modern analyses. This is because the Danes, Dutch , etc themselves had significant depopulation and later migration in the post-Roman era. Eg large parts of coastal Netherlands were virtually entirely depopulated, and then repopulated from elsewhere (? east, ? north). So we're not using solid comparison points. They write "We saw no evidence of a general ‘Celtic’ population in non-Saxon parts of the UK. Instead there were many distinct genetic clusters in these regions,"
Not surprising. This reflects the antiquity and diversity of pre-Roman Britain. I.e. there was no homogeneous "Celtic 'people, but many different tribes and groups under the continual shaping influence from the continent and their own internal evolutions. "My impression is that the study seems to confirm that >50% of British ancestry is "French" and hence surely Neolithic. " I think you're wrong on this one, bud. I pointed out elsewhere there is an excellent paper on the early failure of Neolithicism in Britain. From the mid Neolithic to mid Bronze Age we have what is essentially a pastoral society. Only from the MBA does farming make a 'come-back'. Make of it what you will genetically, but those are the archaeological/ ecological/ palaeobotanical facts. Thank you, Jean. Very interesting read. Notice that there is a snapshot, at the convenient level before the Orcadians split in two (i.e. just before it becomes too nuanced), where we can see five clusters: Orcadians, North Welsh, South Welsh, Scottish (+ N. Irish, + Northern Marches of England), Main English (still including Cornwall). IF the authors would have been a bit more neutral re. "Celts", they would probably have also taken that snapshot as relevant, anyhow it is implicit in the tree shown in the most viewed image. @Grey: Disagree re. the "migration period shift": Swedes (nor Norwegians) are not similar to Danes in the European analysis. It's just a wild speculation you make based on nothing. "There does not seem to be a real "Saxon" proxy. Ger3 and Ger6 overlap in Saxony, and the source populations of NW Germany. 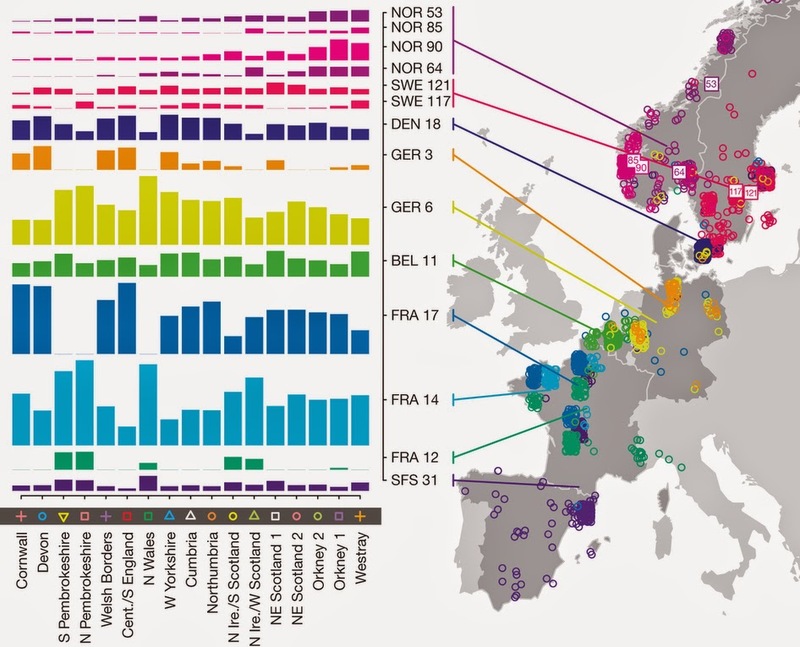 It is difficult to see how that data can be used to infer Saxon ancestry." Wait - did they actually test people from Saxony and Brandenburg? I thought every elementary school pupil knew that naming is a historic accident? People of the Bundesland Saxony are related to neighboring E Thuringia, S Saxony-Anhalt, NE Bavaria, and SW Poland (Sorbs). Also, only about the NW 1/2 of Lower Saxony are historically "Saxon" (in a broad sense). So, even their cluster south of Denmark is barely half inside the Saxon area, at their absolute eastern boarder - so, not a good proxy, at all. They should have used W Schleswig-Holstein, NW Lower Saxony, and the northern 1/3 of the Netherlands. No need to muddy the waters with rather different areas of Germany. One of the big research questions going forward is: Why do we have a nearly exclusively presence of FRA12 in Northern Wales (effectively Gwynedd) and its absence from nearly everywhere else in Britain? The study states that POBI doesn't have a good fix on its geographic origin in modern day France so that information isn't a lot of help in pointing to the source population. "I guesstimate that the light blue French cluster represents Armorican Megalithic input"
The Norman Invasion ca. 1066 CE would surely be the source of a large share of French DNA in Britain. Certainly, a very large part of the entire culture heritage that the Anglo work delivered to the world (such as the English legal tradition) is predominantly Norman, the linguistic Norman influence was great, and we know that the the Normans stayed and settled, rather than being displaced by any later event. What do they mean by 'southeastern England' in the abstract? Do they mean the south eastern part of the Central and South England red squares or do they really mean south eastern Britain? I don't understand why there appear to be no sample clusters taken from Jutland or Angeln on the continental map, or indeed the Weser-Elbe triangle. Or is it not meant to be an accurate map of where the samples are taken from? @Andrew: the Norman invasion of 1066 is well known to have been an aristocratic invasion and such is the legacy it left: almost (but not quite) toppled the English language, leaving a major signature in the vocabulary (French was effectively official for centuries and French is the single greatest contributor to English vocabulary) but otherwise was not so influential. In the end, amidst dynastic conflicts that reinforced the role of the Anglo-Saxon low nobility and commoners, and the loss of the French holdings, the Anglo core rebounded (England stopped trying to be part of France and instead recovered its distinctiveness), albeit dramatically altered by four centuries of officially being linked to France. I'd dare say that it is a very interesting case study for elite driven language shift but definitely you cannot attribute a significant genetic influence to the Norman invasion, no way! Of course but: (1) Normandy is very small compared to England (today it has 3.5 million people, while England has 53 million) and (2) obviously the vast majority of Normans (understood as the general population of Normandy) stayed behind and never crossed the Channel. Only the aristocrats (essentially of Danish ancestry at that time, not properly French) and their entourage migrated and settled. More than 90% of the population back then were farmers and these, unless recruited in the army or as servants, stayed all behind. So at most 5% of the population of Normandy migrated; using today's figures for reference that would be 0.33% of the population of England. Even if you double or triple that figure the impact would be absolutely negligible. That's the kind of cultural and linguistic impact that a tiny elite can make, based almost only on military might and the prestige and influence derived from it. Eurologist, Frisians would be the obvious modern proxy for west Germanic influx to Britain. History recorded that Jutland was vacated and that they travelled to Britain via the Frisian coast where many settled. The Frisian language was very close to older English (ingvaeonic) and the languages remained mutually intelligible into the modern period. That is well known and it is inexplicable that Bodmer would prefer to use Saxony unless it served his intention to deny AS migration to Britain. The sampling of germany does need an explanation. Early runic finds on the continent, ie pre 650 AD, are rare south of the Elbe. They are mostly found in Schleswig Holstein and Jutland north of the river Eider. In England, runic finds which are dated pre are limited mostly to east anglia and east yorkshire. The so called saxon counties have none. The anglo saxon futhorc, sometimes called anglo frisian futhorc is post 650 AD. "It's just a wild speculation you make based on nothing." The migration era never happened? FRA17 extends into Germany - is it pre-migration era Gaul or post-migration German? "Frisians would be the obvious modern proxy for west Germanic influx to Britain"
@apostateimpressions: Regardless of Bodmer's intention, what is clear is that added together the Danish+Saxon+Belgian components, which must include whatever Frisian-specific influence (unless you imagine that Frisians are more French-like than Belgians) they add up c. 25% in English. IMO that's not negligible (particularly the Danish impact is quite apparent, c. 15%) but it's not a mass demic replacement either. In total, the Germanic migrations (including Vikings, who may be more influential than Bodmer acknowledges to) add up to c. 25% of English ancestry. The other 75% is pre-Germanic. 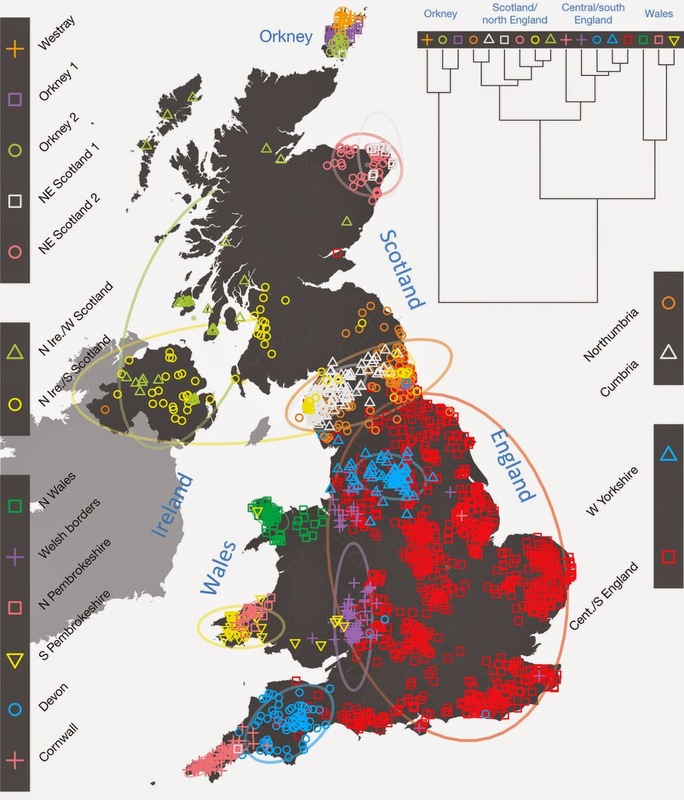 Welsh and Scots have virtually nothing of that, what underlines that (again against the shallowest readings) there is a difference between English and modern British Celts in terms of ancestry. Interestingly, Welsh and Scots do have the German Rhenish component instead, and quite markedly so, suggesting that this component could represent the Celtic-specific genetic impact in the isles. I'm puzzled. If I haven't misread her, I reluctantly agree with Annie Mouse that an early post-glacial source for the North Welsh is unlikely. What she calls the "Mediterranean" component is surely Neolithic, yes? On the other hand, I agree with Mike Thomas that the early Neolithic experiment ran into serious trouble – and other writers have suggested a resurgence of previously marginalized pre-neolithic genetic material as integrated into a new pastoral culture. But where does this HG component show up, if at all? The possible Doggerland contribution? It doesn't surprise me that the so-called Celts are entirely different populations, but is there a detectable pre-neolithic residue to be found among ANY of them? Of course they are, and they are included in the area I described above. However, sometimes you have to cast the net a little wider; the Frisians were in close contact to the actual Saxons and also to the Angles and Jutes. I also disagree that Jutland was completely depopulated; furthermore, there is a long-standing (since the Bronze Age) strong connection between Jutland and Frisia via the ox trade. In summary, I think the British data shows very recent (last few hundred years) associations, nothing of any deep antiquity. The associations with European populations probably show older associations but how old is unknown. I don't think that we can infer anything about the Neolithic, Mesolithic or Bronze age or any early era from this paper. "Mediterranean" does not necessarily mean Neolithic in my mind. It could be older or younger. Southerner basically. Wales is clearly most closely connected to Fra 12 (biggest peaks) so this is our best candidate for the Welsh source population. But its also has a bit of a resemblance to Fra12 which is clearly a johnny-come-lately new arrival as it has not spread to neighbouring populations yet. Fra12 and FRa14 are related to the Spaniards SFS31, so Southerners (from other genetic studies). It might be that the Fra12 population in Wales might have been a LATE arrival also, with the flow over to welsh neighours being an artefact of Doggerland admixture back in France! I cant tell for sure, but it is possible within this data. So the Fra12 Welsh might be the YOUNGEST in Britain rather than the oldest. This would fit with the Welsh/East-Irish coasts being almost the last to emerge as sea level rose. I have been pondering this very point. FRa17 and Ger3 are clearly the same folk essentially. I am thinking that this is a Germanic/Doggerland French population that back-migrated into Germany to become Ger3. My reason for thinking that there was movement from Fra17 to Ger3 is that the Fra17 is isolated in areas whereas Ger3 is spread amongst 3 separate population centres with another group. It looks like a bunch of Fra17s migrated/expanded to established population centres for work or refuge. Maybe. @Grey: "The migration era never happened?" That is not the term I'm familiar with but rather with the notion of "Germanic invasions", which seemingly, except in England and some border areas North of the Alps, left a weak or negligible legacy even in language (most famously the word for "war": guerre/-a). "FRA17 extends into Germany - is it pre-migration era Gaul or post-migration German?" Or Danubian residue? Just saying... I count 5 scattered dots. I'm not sure what it means but it's clear that is not something we cat attribute to the Frankish (it doesn't even relate to Belgium. It could even be scattered communities of Medieval settlers. In any case it's not something big but rather a "burning nail" because nobody may have erased the Frankish legacy, in Germany as in France, to this day. Yet the two countries seem markedly distinct and do not overlap (except those 5 dots) in this study. Compare for example with the Belgian component (very important in France and Rhineland) and how this cluster's influence is negligible across the Channel. It's not just 2 "French" overlapping components but 3 when including the Belgian one, whose importance in Germany (Rhineland) is more notorious and could be attributed to some Celtic of Frankish element maybe. But this component's impact in Britain is tiny, what informs us that Fra14, Fra17 and Ger6 arrived there crossed the Channle before than the Belgian component could expand or consolidate itself as part of the French and Rhennish genetic landscape. Assuming the Belgian component is Frankish (the most favorable scenario to your theorizing), then Fra14, Fra17 and Ger6 are pre-Frankish, i.e. Celtic or Roman at the latest. I think one has to be careful with BEL11, since a low but quite evenly-distributed (over Britain) signature might actually indicate a very old component, such as Doggerland. As to FRA17 in Germany, they could be from the fairly significant number of Huguenot settlers. Someone might want to cross-check were the largest settlements were, and were in France they came from. Since FRA12 only appears in Wales, Ireland, and Scotland, I'd say it's mostly Celtic - which also fits its cis- and trans-alpine distribution around NW Italy and SE France. FRA14 is broadly distributed but highest in Wales and Scotland, so this would be my best bet for the most-similar remaining Neolithic population - largely but not completely driven out of C/S England and Yorkshire - the regions most affected by later migrations. GER6 is widely distributed and again high were FRA12 and FRA14 are, and where FRA17 is very low - so I'd say a combination of Doggerland, Neolithic, and Celtic input. @Eurologist: "Since FRA12 only appears in Wales, Ireland, and Scotland, I'd say it's mostly Celtic".. Anyhow, the English should also have a lot of Celtic (the Saxon+Danish components only add up to c. 25%), yet they nearly lack the Fra14 component, while they have much more normal levels of the other component attributable to Celts: Ger6. Also what would be the source of Fra17 then? Either you argue for an ill-documented division of the invading Celts, that followed the same exact patterns as the two Neolithic waves (what a coincidence! ), or you have to think of something else. We know that the Celts of the Isles were (and are still) divided across very different lines: Brythonic (P-Celtic) and Gaelic (Q-Celtic), with Pictish being either Brythonic or pre-Indoeuropean (depending who you read). The patterns we see regarding Fra14 and Fra17 are not consistent with this division of insular Celts, which should involve a distinction between English+Welsh vs Irish+SW Scots. Nothing like that is apparent in the Fra components. So IMO the Fra components' division shows a pre-Celtic one, one diluted in France (where the components overlap) but not in Britain. It does suggest however an expansion of the Fra17 component to SW England (and even into Cornwall) within Germanization but from elsewhere in England, not from overseas. Sure there's multiple possibilities. My point is if populations moved counter clockwise along the north sea coast after the fall of the Roman empire then some of the components in modern dna might need to be turned clockwise to match up with where it was. "of "Germanic invasions", which seemingly, except in England and some border areas North of the Alps, left a weak or negligible legacy"
Sure, if a weak legacy is assumed then FRA17 can't be from a population that moved. Anyway I don't want to make a case for it as it could be a bunch of things; it's just annoying that the biggest component in the biggest chunk of the population wasn't tied down at all. I'm not sure anything ancient can be derived from this at the moment - maybe later if other people look at the data and maybe find some way of adding time to some of the components - but *if* it could I think the place to start would be with refuge zones on the premise that if earlier layers were pushed back by later arrivals then they'd show up most in the refuge zones. On the further assumption that mountainous areas especially those furthest from the direction of advance would make the best refuge zones then if most of the invasions / migrations were from the north, east and south then I think the likely refuge zones would be north Wales and SW Scotland (Strathclyde). Coming from the north N. Wales is more of a refuge. Coming from the east N. Wales is more of a refuge if "east" includes the Scottish coast, otherwise maybe even. Coming from the south Strathclyde is more of a refuge. If you squint a bit I think you can see the two south and west Scottish columns and the three Welsh columns (five columns in total) do follow a similar pattern in a number of cases. and judging by eye the two components found highest in the presumed refuge zones make up at least c. 40% of the total ancestry while the two components found least in the presumed refuge zones make up at least c. 40% of the ancestry found outside those zones (and possibly an actual majority of the ancestry of Devon, Cornwall, Central/South and Welsh Borders). Ancient refuge zones or not the reversed pattern probably means something. Apart from that, SFS31 and Fra12 seem to have the most southern connection. A last thought, not sure if possible, is could the Fra17 represent a churned population i.e. the end result of the hajnal line anti-cousin marriage thing? Some interesting comments. So, the 3 biggest components in the UK clusters are Fra14, Fra17 and Ger6. Agreeing with Maju, when we look at Fra14 which by the way is from a hospital sample in Rennes and therefore may include people from Brittany, Loire and Basse-Normandie. Its prominence in Wales, Cornwall, W Scotland and N Ireland is striking. In terms of the archaeology, then Armorican derived megaliths do fit very well with this distribution. Maybe this is too simplistic though. What else might explain the link between Western Britain and Armorica, maritime BB? Ger6 sampled in Western Germany is also prominent in the clusters. Again is it too simplistic to tie this to Beakers and the arrival of Celtic languages in the isles via the Rhine? Bel11 is also widespread but in terms of a trail of people into Britain, the low countries were a primary route throughout prehistory so this is clearly complex with overlaying migrations from different periods. Fra 17 is the biggest mystery, totally absent from Wales and perhaps the reason that POBI showed Wales to be the most genetically separate part of UK (after Orkney). In their supplemenatry, POBI say that Fra17 probably represented something pre-Roman. I am not sure. Fra17 is most prominent in Cornwall, Devon, Central/Southern England and fades as you move north!? Is it just me, or am I the only one who fails to see the value in the first map. Is that supposed to be a map of samples ? A few years ago these researchers were promising a haplogroup map. I looked at the preview at Nature, but did not see one in the thumbnail graphics. Is there one in the subscription article ? @sb10: It's all autosomal, no haploid lineages anywhere. The first map is a map of (autosomal) clusters produced by FineStructure, the tree-like pseudo-hierarchy of which is described in the tree at the top right of that figure. Obviously much of what makes those clusters seems to be owed to relative endogamy, so the most interesting aspect seems to be the continental contributors to them, rather than the clusters themselves. Similar people can be easily found all over Britain, but perhaps most often in Wales.